This timeline was distributed as part of the program for Rumble Theatre’s production of Burning Vision, directed by Peter Hinton, in 2002. Reproduced with permission from Rumble Productions. The play Burning Vision, by Métis Dene playwright and filmmaker Marie Clements, is an extraordinary exploration of interconnectedness across diverse histories, cultures, languages, and places. 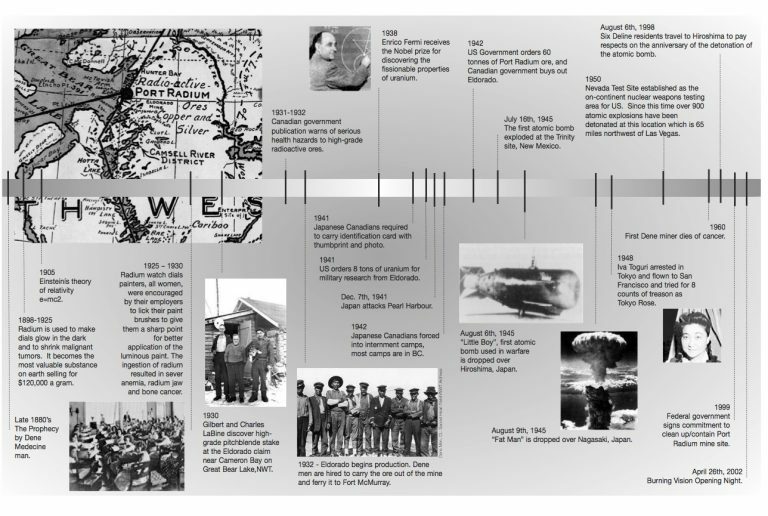 The play traces several intertwined historical trajectories, but the more familiar historical event it narrates is how the atomic bombs that were dropped by the United States on Nagasaki and Hiroshima during World War II were made from uranium mined from the lands of the Sahtu Dene First Nation near Port Radium, Northwest Territories. Although this event indelibly and permanently connected these places in terms of trauma, disease, and environmental poisoning, it also later generated more positive relations of responsibility, accountability, and mutual recognition. 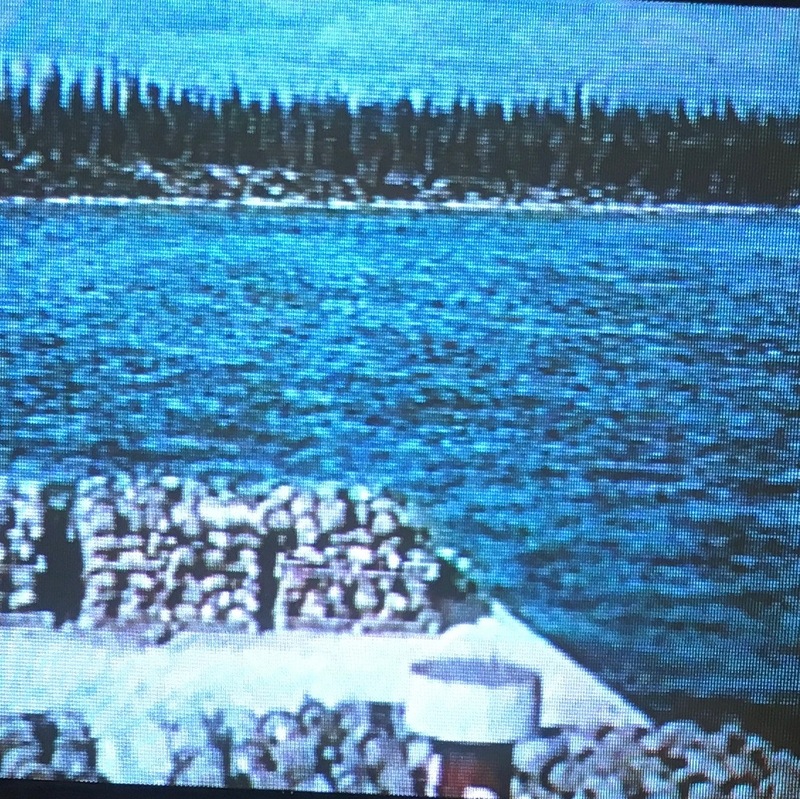 Sacks of pitchblende (uraninite) on a transport boat near Port Radium, Great Bear Lake. Reproduced with Permission from Peter Blow and Lindum Films. Clements’ own family history is deeply connected to these histories. Not only do her Métis and Dene relatives come from the region around Port Radium, Northwest Territories, but also many of her family members worked in the mines and on the transport boats that extracted and conveyed the uranium to refineries. This chapter will help you trace the play’s multiple historical correlations. As you read, think about how Clements has drawn upon diverse historical material and reworked it in the shape of this play. The play is not just informing you about these historical moments, but rather asking you to think about how these diverse histories should be positioned alongside each other. How and why does the language of theatre enable Clements to make these connections? In other words, what does Burning Vision accomplish as a work of drama specifically? How does it use theatrical conventions in ways that distinguish it from a historical document, or a work of fiction or nonfiction? Clements is one of the most innovative theatre artists in Canada. 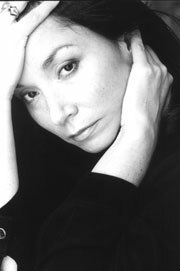 She highlights the language of performance, theatre, and film in her multimedia productions, which often include music, video, new media, radio, and television. Her staging, which juxtaposes different time frames and locations, is often unusual and surprising. The theatrical elements in Burning Vision play an important role in how Clements draws connections between disparate histories. Marie Clements. Photograph by Tim Matheson. Reproduced with permission from Marie Clements and Talonbooks. As you read the play, take note of the many ways in which Clements uses the elements of theatre, such as her stage directions, sound, music, and images, to convey the themes and ideas that drive the play. 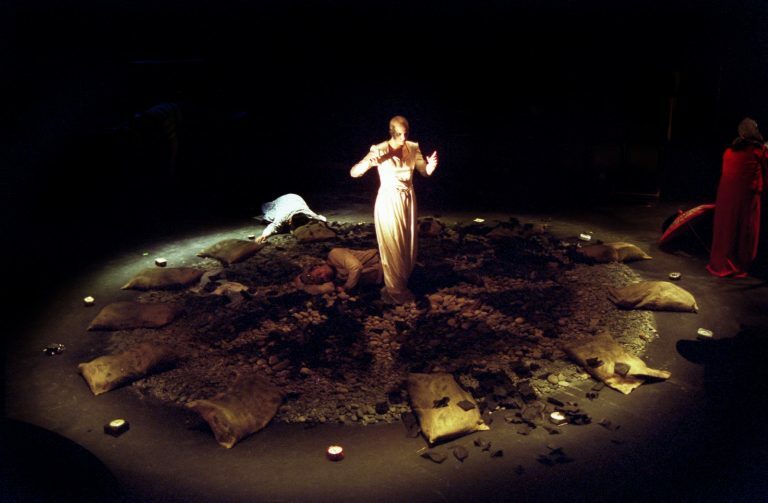 For example, for the premiere performance of Burning Vision in Vancouver, BC, in 2002, the stage was divided into four quadrants like a clock. This clock-like stage brings together several characters from the play from different times, spaces, and storylines, which allows Clements to both connect and demarcate the different histories that she wants to bring into conversation. It also underlines an important philosophical emphasis or direction in the play, influenced by Clements’ engagement with Dene knowledges and worldviews: that everything is related and interconnected. Reading this play may be a confusing and even disorienting process given its complex and nonlinear structure and the many colliding platforms of time and space that it draws together. However, its very complexity is what makes the play so rich and immensely rewarding to read, write about, stage, and discuss in the classroom and beyond. Timeline. Examine the timeline that precedes the play. Are there any historical facts or details that are new to you? Are you already familiar with any of these events? What idea of history does the timeline suggest? Title. What is the significance of the title Burning Vision? Brainstorm some associations you may have with this image. Do these associations match the ways in which the image is explored in the play? Form. Each of the sections of the play has two different subtitles. The first section, for example, is titled “The Frequency of Discovery” and “Movement One.” How do these subtitles simultaneously locate the reader in terms of space and sound? How do these subtitles create word plays or double meanings? Characters. The casting notes suggest that sometimes, the same actor plays more than one role. For example, the same actor plays the Japanese Grandmother and the Dene Widow. How does this casting direction from Clements impact how you interpret the characters and their relationships with one another? Burning Vision. By Marie Clements. Rumble Productions. Firehall Arts Centre, Vancouver. 23 Apr. 2002 – 11 May 2002. Performance. The Radium Painter (Erin Wells) stands in the middle, with bags of uranium ore and rocks surrounding her; the Miner (Marcus Hondro) lies at her feet; the Japanese Grandmother (Margo Kane) stands with her back to the audience; and the Dene Carrier (Kevin Loring) is slumped in the back of the stage. Photograph by Tim Matheson. Reproduced with permission from Rumble Theatre and Urban Ink Productions.